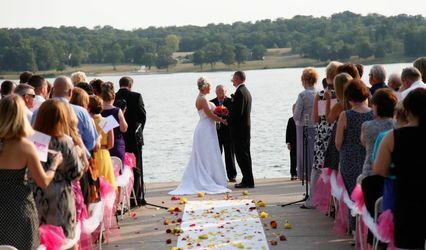 Innsbrook Resort is a picturesque wedding venue located in Wright City, Missouri. 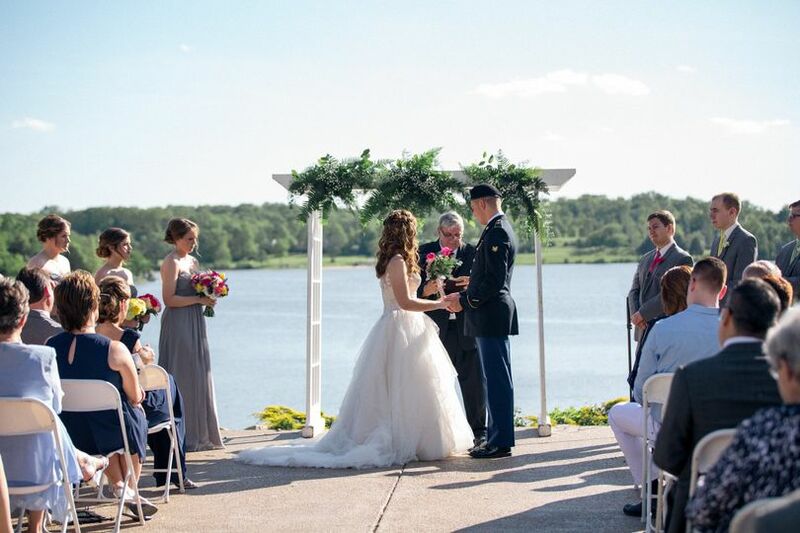 This lakeside venue offers a multitude of outdoor and indoor options to host your wedding ceremony, reception, and rehearsal dinner throughout the resort. 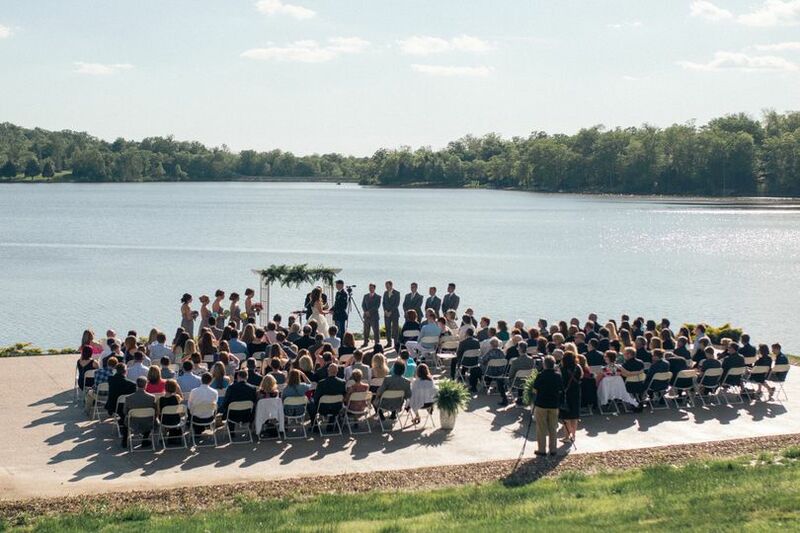 This venue is set amid hills and sparkling lakes on 7,500 acres just an hour west of St. Louis. They have been hosting awe-inspiring weddings for more than 40 years. Innsbrook Resort accommodates intimate celebrations as well as lavish affairs for up to 250 guests among their eight different event spaces. 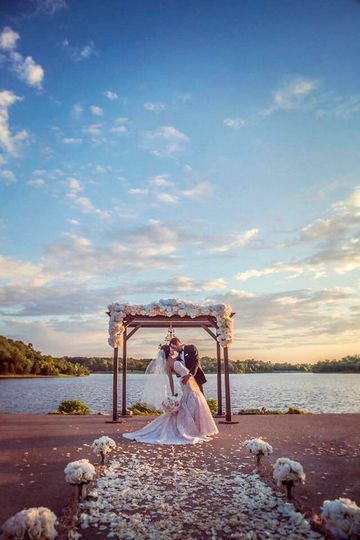 You can hold your ceremony overlooking one of the 100 glistening lakes under the bright blue skies and a floral-covered arch. 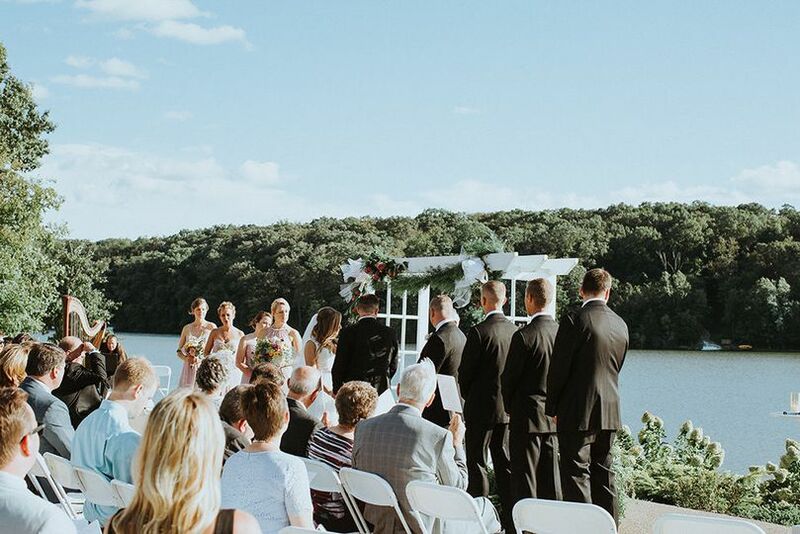 The spaces throughout the resort range from a stunning lakeside stage, an elegant event center that looks and feels like a lodge, a charming country farmhouse, and the picturesque Oak Lawn. Any of these locations would be ideal to host your ceremony and reception. There are get-ready rooms available at the resort for you and your wedding party. There is also ample parking on-site. 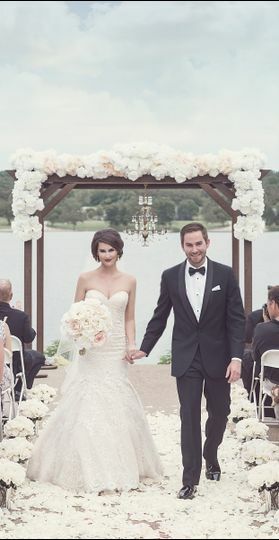 The professional and experienced staff at Innsbrook works with you to bring your wedding vision to life. They tailor the event to you and your style, and can add extra fun touches like a bonfire once the sun goes down on your reception. The venue does provide chairs, tables, linens, flatware, glassware, and china to use for your big day. The staff at Innsbrook will set up and clean up the spaces on the wedding day as well. You can bring in outside vendors, as needed, to bring your wedding vision to life. Innsbrook Resort offers numerous residential properties and recreational options for you and your guests as they gather for the wedding. There is a first-rate restaurant, a championship golf course, numerous lake activities, and several nature trails on the property. The resort also serves as a great bachelor/bachelorette getaway as it is only an hour outside the city. 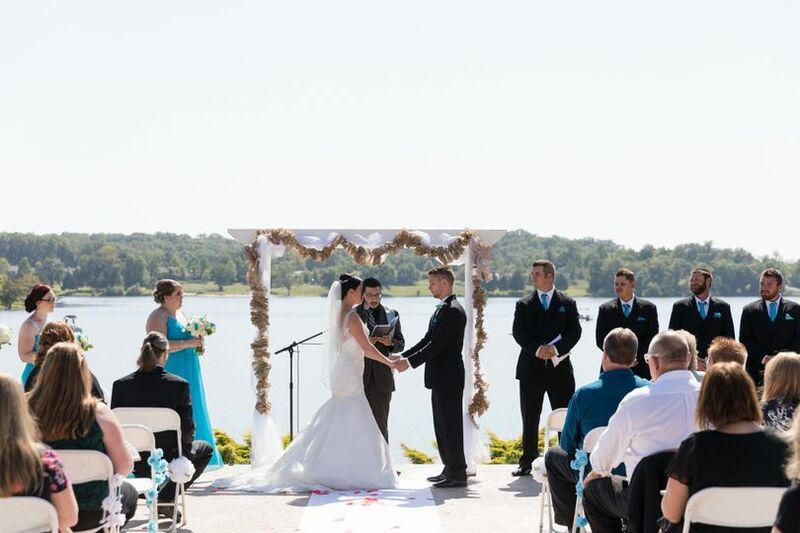 We had the pleasure of getting married at Innsbrook this past weekend. The ceremony was held lake side and our reception was held up at the lodge. We couldn't have asked for a better experience for us or our guests. The setting was simply breathtaking, the service was impeccable and attention to detail by the staff was amazing. Jeannie and Cassie were our coordinators who are the best in the business. They took extremely good care of us throughout the entire planning process right up until the end of the night on the day of. They are extremely professional, friendly and easy to do business with. I consider them such a blessing - they made everything so seamless. The food was delectable as well - Kelly the beverage manager and Chef Jim outdid themselves on our guests' experience. We're still getting compliments on everything from the cocktails to the passed hors d'ouvres to the amazing entrees. Kristina helped us with lodging including coordinating welcome bags and ensuring all of our guests had comfortable accommodations. This is a great spot for a wedding getaway weekend and everyone had a great time golfing, horse back riding, hiking and taking in the lake life over the course of the weekend. We are so thrilled we found Innsbrook and their incredible staff. Truly amazing! We had an amazing experience! The staff was great, and our Ceremony was beautiful! Would highly recommend! I had my wedding at Innsbrook on April 8th. My husband and I couldn't have been happier with Ciarra and the entire Innsbrook staff! Ciarra's personal attention to detail and her customer is service is unmatched! From the amazing room set, the food and the staff, everything was incredible! Chef John truly out did himself with the menu! We were served family style and my friends have made the comment it's the best wedding they have ever attended! I would highly recommend Innsbrook for not only your wedding, but rehearsal dinners and bridal showers as well. I had all three events at this venue. The clubhouse after-party, hosted by Kelly Dean and her staff was amazing! We had karaoke and everyone was singing and dancing! The after-party food was the perfect menu for late night entertainment. Where can you stay with a lake-view, have your rehearsal dinner, play golf, have your wedding, your after-party, and brunch the next morning?! Memories were made at Innsbrook! 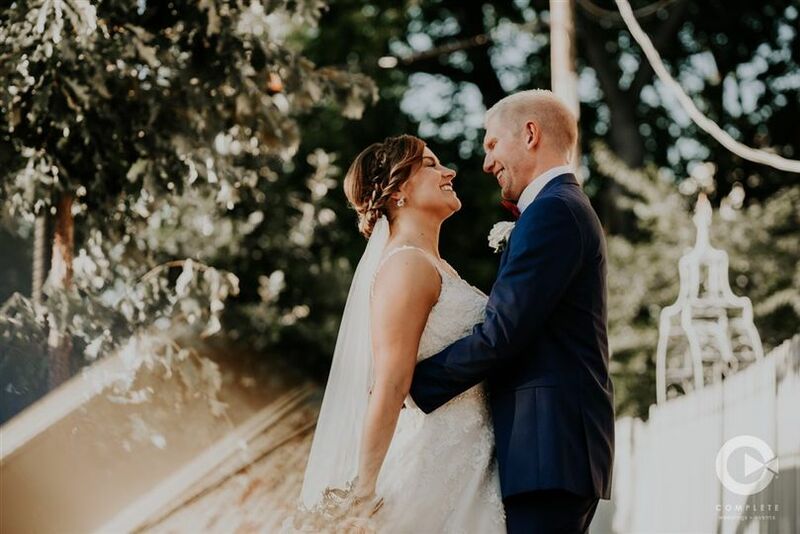 Save up to $1,250 on your summer 2019 wedding at Innsbrook and enjoy a gorgeous, natural setting in full bloom, service second to none and a day your guests will be talking about for years to come! Visit our specials page at www.innsbrook-resort.com/weddings for details! 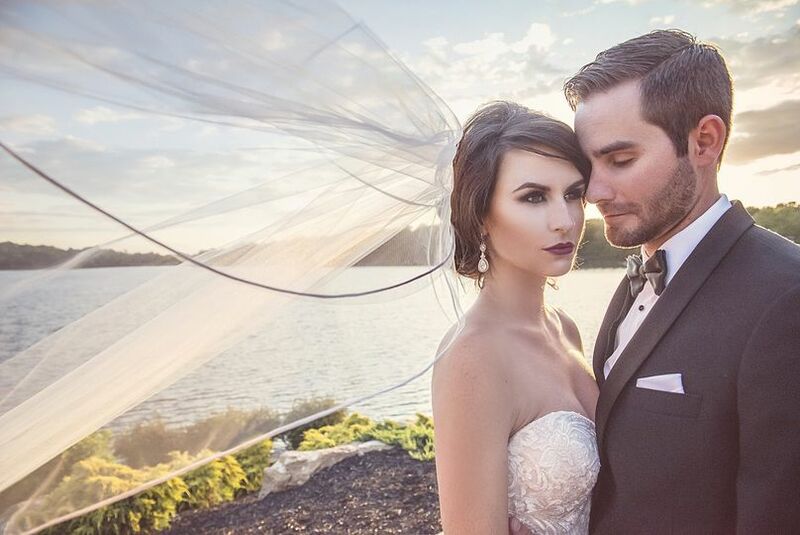 Book your wedding at Innsbrook and we'll throw in your engagement photo location for FREE. 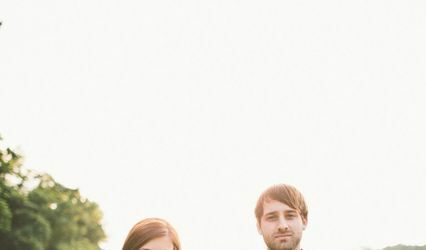 Rather than having the traditional and standard portraits, let your engagement photos tell the story of your love by choosing a location that is truly unique. Here are a few ideas...go hiking, by the barn at the stables, fishing, picking flowers in a field, building a sandcastle on the beach and more. With over 7,500 acres and 100 lakes, the options are truly endless. We work TONS of events with Innsbrook every year and they are always completely perfect. Not only is the venue itself the escape you are looking for, but the team there is so helpful and pleasant while being a part of your Big Day. From Ciarra helping with the reservation and planning process to the bartenders and servers the day of...everyone is so pleasant to deal with. Always a smile on their face. The venue is GORGEOUS!!! You feel like you&apos;ve escaped the city. It&apos;s so tranquil and relaxing.